Fans of “A Series of Unfortunate Events” have reason to believe their misfortune is over. After a less-than-satisfying 2004 film adaptation, the Baudelaire orphans might finally return to relevancy via Netflix, which is releasing an episodic series of the narrative in August. The dark children’s series, which published 13 books from 1999 through 2006, follows three orphan siblings — Violet, Klaus and their infant sister Sunny — as they bounce from various caretakers while simultaneously dodging their evil inheritance-seeking uncle, Count Olaf. So far, the news surrounding the Netflix project has been sparse, but encouraging. For one, we have our villain — and he’s a good one. After much fan speculation, Neil Patrick Harris tweeted Jan. 16 that he will play the nefarious Olaf, saying he was “excitedish” for the role, and “spending all day with those three horrible child actors, that will be a challenge.” He finished the tweet with “#sneer” and “#shudder,” already embracing his role as the worst uncle ever. Preceding Harris, Jim Carrey gave Olaf a bombastic performance in the 2004 film, which was laughable for all the wrong reasons. Carrey’s Count was the fatal flaw of the failed film. Not to criticize Carrey’s comedic chops, but the character he created was simply not the same as the book. His silliness made a mockery of the frightful villain that stalked the three Baudelaire orphans for seven years. Before the film, Carrey’s only role similar to the part was in “Eternal Sunshine of the Spotless Mind,” in which he played Joel, a self-loathing depressive who gets his memory of an ex-girlfriend erased. While an excellent role for Carrey, the part was neither creepy or antagonistic, two things the Olaf role demands. In contrast, Harris guarantees a stronger performance because of his experience in the macabre. In one of his more serious performances, he played Desi Collings in the film adaptation of Gillian Flynn’s “Gone Girl” (2014) — a character whose worrisome adoration for Amy (Rosamund Pike) is subtle, but shudder worthy. More recently, he guest-starred in “American Horror Story: Freak Show,” the fourth season of the series, as troubled ventriloquist Chester. Harris isn’t the only actor with a mop-up job. Netflix also revealed Jan. 26, Malina Weissman and Louis Hynes will join Harris as the new Violet and Klaus Baudelaire, respectively. Weissman has turned heads as a young Supergirl in the CBS television series “Supergirl,” but this marks Hynes’ first appearance of any sort — a very coveted role for a newcomer. 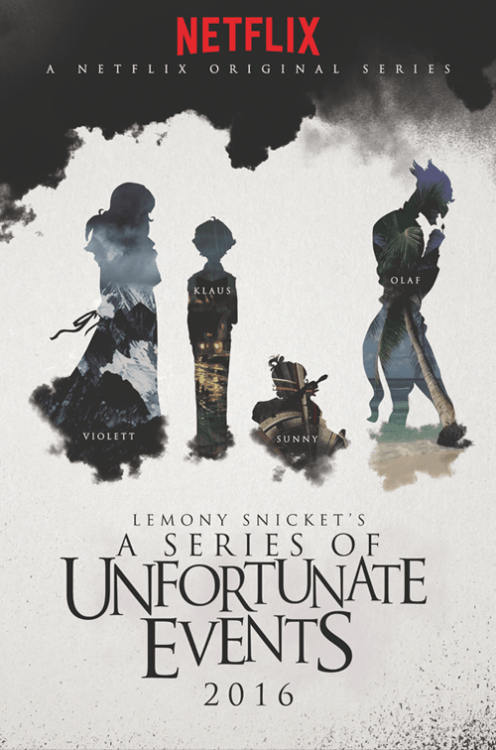 The team behind the Netflix series also includes the film’s original producer Barry Sonnenfeld and American author Daniel Handler, who wrote the original “Unfortunate Events” books under the pen name Lemony Snicket, as the executive producer. The film only covered the major plot points of the first three books in the series and flopped so badly that the rest of the novels never made it to the big screen. Despite the film’s unpopularity, there was so much hype leading up to the release date that it made $30 million on the opening weekend. It’s unclear which books Netflix will adapt right now, but its mass-release format and freedom from the Motion Picture Association of America’s rating system makes Netflix a hopeful home for the series. With a catalogue of successful shows like “Daredevil” and “Orange is the New Black,” the streaming service is primed for a story with as many installments and devastating deaths as the Baudelaires’ — none of which felt particularly heavy in the film’s 107-minute runtime. For a children’s series, “Unfortunate Events” has some of the more grizzly deaths of the genre — many of which are murders — that producers could never honestly adopt in a PG movie. The orphans’ caretakers and newfound friends suffer deaths by poison, a lumber saw, harpoon and are eaten by leeches and lions, to name a few. In addition to multiple ill-fated guardians, the Baudelaires also transverse secret societies and host other recurring characters and concepts that an ongoing series can explore more thoroughly than a single film or film series. Point being, nobody wants to be handed the meaning behind V.F.D. after a meager hour and a half. Thus far, the few concrete details about the revamped Baudelaire series look promising. We can only hope that it translates into anything but unfortunate.